Jim Carroll Scholars of the World Unite! 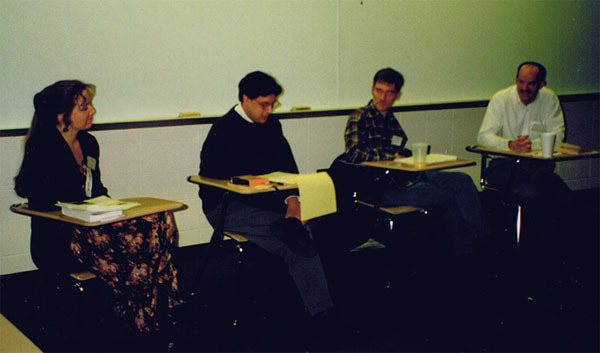 In November 1996, the Jim Carroll scholars of the world assembled together for the very first panel presentation devoted to Carroll scholarship at an academic conference. The panel was titled, appropriately enough, "Jim Carroll." The photograph below commemorates the occasion. Panel chair and organizer; also MPCA conference program director. Paper title: "An Unbearably Wholesome Misunderstanding: The 'Canonization' of Jim Carroll." Paper title: "The Basketball Diaries and the Failure of Adaptation." Paper title: "Coping with Chaos: Jim Carroll and the Contemporary Search for Ritual." Dr. Perrin's dissertation chapter dealing with Carroll is available here on the Jim Carroll Website. Paper title: "Hoops, Heroin, and War Baby Blues: Historicizing The Basketball Diaries."